App Builder Appy Pie: There is a wild popularity of mobile apps and it seems only to get higher as more and more mobile apps are being released for download and the number of apps being downloaded are increasing too. However, do you think all these 5 million and more apps were built in the same manner, with the same underlying technology? Though historically mobile apps have been native, which need to be downloaded and installed on the mobile devices before they can be used. Also, these are developed for a particular platform whether it is iOS or Android. In recent times, however, the cloud apps have been gaining popularity and there are some really good reasons for the same. It is natural for a beginner or an app novice to be befuddled by the technical jargons that are thrown around while talking about Mobile Cloud Apps and mobile Cloud Computing. To begin with, let us start by discussing some of the key terms and concepts that come up while talking about or working with Mobile Cloud Apps. There is a lot of talk about cloud technology and “the Cloud”, but how much do you actually know about it? This is definitely not a fad and the process of moving from the traditional software on to the internet has now been going strong for at least a decade! Cloud Technology or Cloud Computing is a kind of outsourcing of computer programs. The computer programs that are being hosted by an outside party reside in the cloud and it is through cloud computing that the users can access the software and applications from wherever they may be located physically. This is huge, because the users do not have to worry about storage or power and can still enjoy the end results without compromising on quality. Before cloud computing came into the picture, the traditional business applications that were used were pretty complicated in their use and would typically cost a bomb. In addition to that, these systems need quite intense support in terms of hardware & software and it can prove to be quite daunting to begin with, especially if you are just starting out! This means that you would need an entire team of experts who would help you install, configure, run, test, secure, and update all of it. Imagine doing this for several apps, the efforts would have to multiply by that factor, which is probably why even the biggest companies with robust IT infrastructure fail to build the exact apps that they hope for. And if you are a small or medium sized business, you probably don’t even stand a chance. This is where cloud computing technology stepped in to ease out the business owners and the users alike. However, we would get into the benefits of using cloud computing a little later. There are three different kinds of cloud computing and as an app developer or as an app owner, you must be aware of it. In this type of cloud computing a third party would host a range of elements of infrastructure including but not limited to hardware, software, servers, and storage, while offering the benefits of a backup, security, and even maintenance. In this particular type of cloud computing a range of software, for example the internet browser or an application can become a usable tool. This branch of cloud computing allows users to develop, run, and manage applications without having to struggle with coding, storage, infrastructure or any such things. The cloud-based data, applications, and services that have been designed specifically to be used on the mobile devices are comprehensively referred to as the Mobile Cloud. This is what makes it possible for the applications & services to be delivered to mobile users who are empowered from a remote cloud server or environment. Mobile Cloud is a combination of mobile development with cloud-based services. Typically, in context of mobile cloud, the storage, applications, computing, and services are all delivered through cloud. Even though the mobile devices are equipped with native apps and resources, almost all the processing is carried out on the cloud server located remotely and every application is accessed through the browser, instead of doing so locally. Mobile Computing is essentially an interaction between man and machine by way of which a computer is expected to be transported during normal usage which makes it possible to transmit data, voice, and video. It includes mobile communication, hardware, & software for mobile devices. Mobile Cloud Computing or MCC is a combination of cloud computing, mobile computing, and wireless network, in order to bring rich computational resources to mobile users, network operators, as well as cloud computing providers. The underlying idea here is to make it possible for the rich mobile applications to be executed on a huge number of mobile devices. However, in all this terminology it is important to understand how one differs from the other, and for that purpose we look into the key ways in which cloud technology differs from the others. A cloud app or a mobile cloud app is an application that operates through the cloud and has a unique combination of characteristics from both, pure desktop apps and pure web apps. This is a software program where cloud-based and local components work together in a congruent manner. How the Cloud Apps work? On a remote data center operated generally by a third-party, data is stored, and compute cycles are carried out on. The uptime, integration, and the security aspects are taken care of, by a back end, which also supports a multitude of access methods. The cloud applications are known for their responsiveness and for the fact that these need not be permanently stored on the device. These apps can function online quite well, however need to be updated in the online mode. Cloud apps can be placed under constant control, but they do not always occupy any storage space on a computer or communications device. Provided there is availability of a decent internet connectivity and the cloud app is written well, it is sure to offer the same experience as that of a desktop application, while offering the portability of a web app. As the world of mobile app technology is evolving rapidly, there are a great number of key decision points that the new-age mobile app developers need to confront time and again. One of the key deciding points is choosing between mobile cloud apps and native mobile apps is the site where it may be stored. A native mobile app is installed directly on a mobile device and a separate version may be created for each of the mobile device where the app would be used. It may either be pre-installed on the mobile device or be downloaded from an app store to be installed on the device. 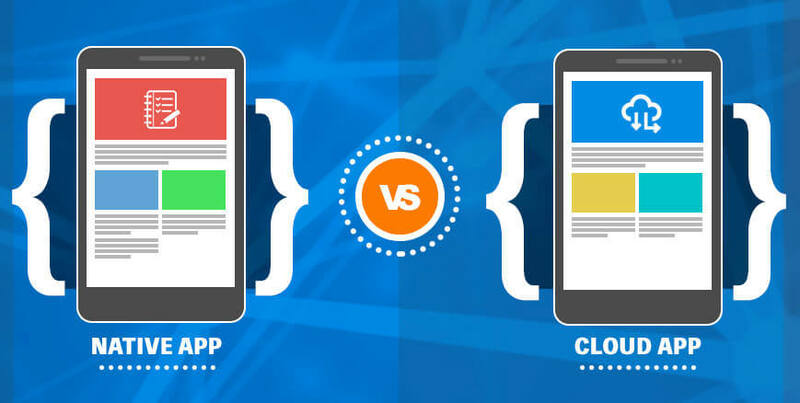 Mobile cloud apps are quite similar to Web-based applications and the main similarity between the two is that they both run on external servers and need the use of browser on the mobile device to display before giving way to the app User Interface. A mobile cloud app does not need to be downloaded and installed on the device as the app UI can be viewed by the user by way of a browser window on the remote device. These apps need an internet connection to function. For native apps it, of course is native, but for cloud apps it is emulated. Notifications are typically supported by all native apps, whereas the cloud apps would not natively support notifications. Native apps have access to the on-device features like GPS, camera, locomotion, and sound. Cloud apps however, have access to limited on-device features made possible through APIs that reach down to the device itself. Mobile cloud apps view the UI by way of a mobile device browser and for this reason Native app UI is a whole lot faster than the cloud apps. For mobile device users, security is a constant threat and concern. Native apps tend to access business data remotely and then leave it on the device, which poses as a big risk in case the device were to be stolen or lost. In case of mobile cloud app, however, all the data is stored on the mobile cloud, which automatically lowers the risks associated with data security. Mobile cloud apps are cheaper to develop & maintain as compared to the traditional custom made native mobile app. Mobile cloud apps work only when there is internet access. Native mobile apps, however, can function even when the device is offline. This functionality, however, is limited. Web Applications are almost entirely designed with an intent to be used from a web browser. Mobile cloud apps aren’t always completely dependent on the web browsers to be able to function. The scalability of web applications is limited whereas the mobile cloud applications are inherently scalable. The user data & business processes for the web applications are stored in a single data center as opposed to cloud apps where there are a number of replicated data centers exist. The web applications run only on the providers’ web servers, whereas cloud apps can run on the computing systems of the users in addition to the providers’ web servers. In context of Web Applications each customer makes use of their own instance of the application, whereas in case of the cloud apps the provided application is fixed for each one of the customers. While web applications are isolated-tenancy solutions, cloud apps are multi-tenancy solutions. Apart from the fact that both of these terms involve using wireless systems to transmit data, everything else is different. Cloud Computing affords a bridge between the client’s local or closed networks and their private data storage & backup systems. Mobile computing allows a barrage of functions including accessing the internet through browsers, supporting multiple software applications with a core operating system, and exchanging a varied range of data types. Typically, mobile computing is more or less a consumer-facing service. Cloud computing on the other hand is something that is the preferred solution for a great number and variety of businesses & companies. Cloud computing is about designing new technologies and services that would allow wireless or hardwired data sharing over distributed networks. Mobile cloud or computing pertains to the development of new hardware & interfaces. Cloud computing offers businesses the freedom to access services & functionalities that were as yet only accessible by way of wired connections. Mobile cloud works with the intent to make the services available through various mobile network operators. Cloud computing assumes the role of an amalgamated entry point that lets the users store & manage their files while being able to use an entire range of inherently advanced computing abilities. 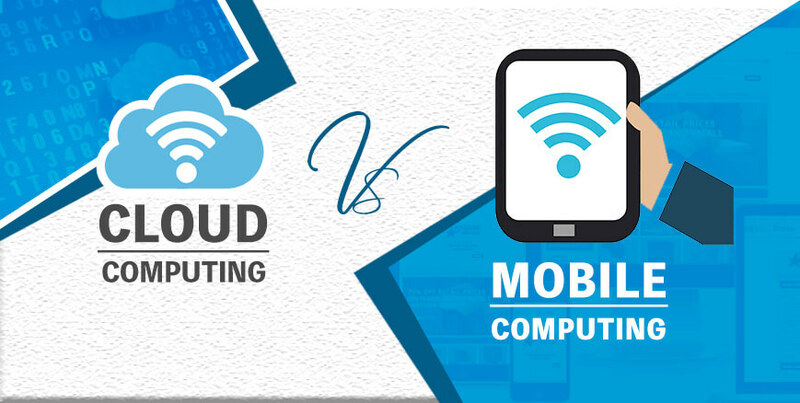 Mobile computing however focuses more on intelligent connectivity, instead of focusing on virtual hosting & resource sharing. Now that you are aware of the basics of cloud apps and differences between key terms and technologies, it is time to move on and explore the many advantages of mobile cloud apps that not just the developers, but the app users also draw multiple benefits from. As mobile technology is traversing new frontiers and the number of mobile users is increasing exponentially, the need to adapt to mobile cloud computing is imperative. For someone who is looking to make a mobile app for their business, you must have looked into the kind of money that is involved in it and the kind of budget you would have to set aside for it. So, you know that this is not really a paltry sum of money and might need you to take a look at the whole planning aspect yet again. How much do you think it costs to build a native mobile app? While there is no single answer to this, because the price tends to vary from app to app, depending upon complexity, features, design and so many other factors, but it is definitely not going to an inexpensive affair either. Apart from that, there is a whole lot of time that is needed for individual iOS & Android native mobile app development. This means that when you are planning to build separate apps for both the major platforms, you are essentially going to double this cost that you were anyway shocked about! Building mobile cloud apps are cheaper than native app development, add to it the fact that you only have to develop one app for both the platforms and the deal gets sweeter! This is especially suitable for startups or other businesses who do not necessarily have deep pockets and cannot afford to spend endless amount of money on building a native app. One important expense that most of the novices tend to forget about is the ongoing maintenance costs associated with a native app. Imagine having two different native apps, one each for iOS & Android! It might not really be wise for you to dive into development of native apps without first considering this expense. This might land you into a situation that you cannot back out of, but is way too expensive for you to carry on with. Now mobile cloud app development is definitely not available for free, but it does help you save a whole lot of money before you begin developing the app, while you are developing the app, and after you have already developed & published your app. The third-party data sources and data storage services can be accessed with an application programming interface or API. It is with the use of these APIs that the cloud apps can be kept smaller in size as the data is handed to the applications or API based back end services for processing or analytics computations and the results are handed back to the cloud application. The cloud apps have one big advantage for the users, that is they do not have to download and install these apps on their mobile devices to use them. The app users can view the entire interface and use it seamlessly on their browser window. The native apps, however, need to be installed on the users’ mobile devices before they can even begin to work. The apps would also have varying versions for different users depending on the kind of device they are using; hence the experience would also vary for them. The cloud apps, however, function much like the web-based applications. What happens is that the apps fetch the data directly by interacting with the cloud, which ensures that the apps run smoothly in order to provide a flawless user experience. If you think once you have released your app, your job is done, and you can simply sit back and enjoy the view as your app does all the work for you. There is a need for constant maintenance and update, while still improving the app and the app experience. This maintenance and improvement is important but does come with a price tag as well. It is only natural that you want to grow your company and while doing so, you also want to scale your app along the way. In order to do this, the sensible thing to do is to begin with a release or launch of an MVP for your app and then keep adding features as and when needed to keep bettering the user experience. None of these reactions can do you, your app, or your brand any good. It is for this reason that new features, updates, and bug fixes must become your priority. This is achievable even with a native app, but the complexity and the cost involved in it are a lot higher as compared to cloud apps. In cloud apps, you would not have to release a new update or a new version for every feature you want to add, and the user would not have to install the new updates to their devices for an enhanced experience. If you are building an app for business, you are going to have to integrate some kind of a database with it. This process can become one of the most complex, tedious, and confusing aspect when you are building a native mobile app. And, like we said, “time is of the essence!” and while deciding the timeline of native app development, you would have to assign a whole chunk of time to the process. The cloud apps however make this step a whole lot easier, simply because all this information can be synced through the cloud server. If you have any experience with native apps, you must be aware that all the app data is stored on the local server, but what do you think would happen if the server were to get damaged or destroyed? Though you might not want to think about it, you can certainly not ignore it either. A natural disaster could damage your local server, and with it your data would be lost forever too! However, if you were to build a cloud app, all your data would be stored on multiple servers and would be backed up a lot more efficiently too. While it is true that the chances of the local servers being damaged might be really low, but there is no harm in storing the data on cloud to be prepared in any such eventuality. How long do you think it takes to build a traditional, native mobile app? Here again, there is no fixed answer to this question. The time taken to build a native app varies for each of them, depending again on the features, complexities, design requirements and so many other things. When it comes to business, time is of essence and especially the startups or entrepreneurs understand it the best. There has to be a defined & realistic timeline for development of the app depending on the kind of app you are building. Native app development is a long process spread over months together. In case you are looking to develop a native mobile app with certain very specific features which are quite complex, you might end up spending anywhere between 6 to 12 months. It is not unusual for certain native apps to take even more than a year of development, before they can be launched. This is where cloud apps can prove to be a godsend, as they do not take this long to develop, and you do not have to go through the whole process twice in order to establish a solid presence on both the stores. The benefits of getting your app quickly to the market are many, but the most important aspect is that you would be able to see the returns on your investment sooner. Apart from this, with speed, your app also gets the competitive advantage. If you manage to launch your app sooner than your competition, you get the first mover’s advantage and the target consumers are more familiar with you, even before your competing brand launches their app. The thing about cloud apps is that they can be quickly updated, tested, and deployed. This means that the enterprises get the benefit of getting their apps quickly to the market, thus getting an edge over their competitors. The speed with which this happens can actually bring about an entire culture shift within the organization, making it a whole lot more responsive. The native apps characteristically store all the data locally on the devices on which they are installed, which may lead to quite a few challenging situations especially related to safety of the data. Not only is there a chance of the data being lost when the device is, but there is also the fear of all the information encounter errors & malfunctions if the app were to have any such issues. In context of cloud apps, the data is stored in the cloud, which means the chances of the information getting lost are a lot lesser. This means that cloud apps inherently are at a lower security risk. When you are building an app through which you intend to accept payments, you are going to collect sensitive customer information, and it is you who is responsible to keep all this data safe. In this day and environment, data security is one of the biggest concerns among most app users. More than 70% of the adults in the United States fear for their money or identities being stolen, if the security aspect of the app weren’t strong. If you do not pay attention to the security aspect of the app and gain a reputation for breach of privacy in context of consumer data, there is no chance for you to make a comeback from there! Storing data on the cloud is one of safes methods to keep your and your customers’ data safe. One of the biggest griefs of working with native mobile app development is that the developers need to develop separate apps for both the major platforms – iOS & Android. The fun of working with cloud apps is that they can work on both the operating systems without having to go through any tweaks, adjustments or coding. This means that as an app owner, you do not have to develop separate apps for both the platforms, instead you get the advantage of being exposed to the audience from both the platforms without any hassle! It is an eternal dilemma for the developers when they are deciding between going for Android or iOS first. As mobile cloud apps enter the picture, this dilemma is taken care of, forever! It is true that the number of Android devices is a whole lot more and they are currently dominating the market. But simply because they are more in number, does not mean that you should take your decision based simply on this factor. There are a whole lot of reasons for developers to opt for the iOS platform as well. This dilemma of making a choice between the two platforms can only be understood by someone who has had experience in building apps in the past. Today, however, if you decide to go for a mobile cloud app, then this dilemma is eliminated entirely. This means when you get to launch your app on both the platforms simultaneously you get the advantage of higher downloads coming collectively from both the app stores’ audiences, finally reaping in more revenue. The advantages that we talked about must have put you at ease if you were on the edge about mobile cloud apps. However, like every other technology or tool, mobile cloud apps too have their own set of disadvantages or challenges that you must be aware of. This is one of the biggest concerns with cloud computing as it is related effectively to the users and their actions. It is possible for the mobile users to inadvertently give away sensitive information through the network or while using the application. This is why the mobile cloud applications need to be suitably secured and failing to do so is going to increase the risks related to user actions. Performance of an application is an imperative concern and factor that impacts its success, and when it comes to the mobile cloud apps, the concern grows only stronger. The mobile cloud applications are hosted on remote servers that are then accessed across public networks leading to slower responses and slower speed of the applications, thus lowering the overall performance. If you want to use a mobile cloud app, you need an internet connection. Hence, if you were to be in an area that has no or low connectivity, you might not be able to use the mobile cloud app. ‘The Cloud’ as they call it is gaining popularity and the professionals are getting quite excited about both, application development and testing in the cloud, especially as an increasing number of businesses are launching public and private cloud computing initiatives. Typically, cloud development includes integrated development environments, components of application lifestyle management, and components of application security testing. The experts and professionals who have been working in the field swear by the obvious advantages of developing in this arena like saving costs and increased speed to the market, but they also warn about some challenges or surprises that you might encounter in the process. It is oft experienced by the developers that the configuration that they use in production is very tough to replicate on cloud services. For example, if you have developed a cloud application and are planning to bring it back to run locally, you would need to test against a legacy system that can’t simply be copied onto a cloud service. Here, service virtualization technology can come in handy, and developers can leverage the market offerings that can enable multiple or parallel branch development. For developers who are used to non-cloud development might even come across some surprises when they engage in Web Application building in the cloud. One of the developers, for example who was building an online registration application was surprised by the fact that he needed to acquire quite an in-depth understanding of database structure and the pertaining user interaction after the app would be released. In some of the cases however, the cloud apps do tend to behave a lot like the real-world versions (though they were the old-world versions). It might come as a surprise to non-cloud developers that the developers working in the cloud still need to use command-line tools, XML, & SQL. It is however expected that the old-school approach would finally change as the adoption of the trend increases. If the systems you plan to integrate the application with are hard to access and hard to replicate, then it is going to be equally difficult to develop and test the app on cloud computing resources. It is for this reason that most of the developers avoid developing high-end applications in the cloud that need stricter levels of data security or evolved regulatory restrictions, or those that rely on legacy coding projects. However, cloud seems to work really well when you want to do something like running a development server Amazon.com’s public cloud service and to build an application for student information system, archive for student transcripts, and for selling schoolbooks. No matter how much of a buzz there may be for cloud computing, it still is a fairly new concept for most developers and may emerge as a disruptive technology, even in the development arena. There have been instances where the cloud development projects were pretty well-received by the management, the sales division, and everyone else who would be using it in an organization, however it was the IT team and the developers who were most hesitant and negative about it. This is mostly because this was an entirely new development platform. Since this is a comparatively unchartered territory, there is a dearth of documentation which would help the developers in understanding the cloud and the pertaining tools and resources that may be used to build applications in the cloud. Though this is bound to change with time as the demand for cloud development and testing increases and larger number of companies begin adapting to the concept of the cloud. However, till that happens, it is a good idea to hire the experts or some consulting firms that can fill this gap. Sometimes cloud development might entail developing in your own private cloud that might probably lack the multitenancy and load-movement capabilities that have the ability to ensure round the clock ability of your applications. While working for cloud, one of the toughest things to do is to design for, and plan for a variety of scheduled and unscheduled server maintenance issues and ways to fail over with grace. Some other issues that may have an impact on development and testing include network delays & latency and the size of network pipes, in some parts of the world specifically where the connectivity is low or intermittent. This becomes specifically challenging for those organizations that have a geographically diverse presence. In such cases, it becomes infinitely tougher to synchronize check-ins, builds, and automated testing. This is then taken care of, by doing some local and regional builds supported by code check-in on the virtual servers which are available to everyone involved. In this scenario, care must be taken that they all stay in sync with the master versions on the private cloud, which need independent or third-party tool. This is more of a potential problem, but a big one indeed. It is quite easy to end up wasting money on cloud fees. It is quite common for the developers to end up forgetting about or neglecting to turn off any virtual machines that they have not been using for a while. This means that they might simply leave some stuff up and running for longer periods of time like say a weekend. If this were to happen in case of an in-house capitalized server it’s not really a problem, however, when it comes to pay as you use resources like in case of public cloud computing, it can run up quite a substantial bill! This is one of the non-technical issues but has the potential to pose quite a challenge for you. This can best be demonstrated with the case study of Kelly Services, a temp agency of national standing. Some time back they decided to adopt cloud development for quite a few of its in-house applications, and for the delivery they decided to use Force.com. Though they confessed to the cloud development bringing about noticeable benefits like shorter turnaround time in developing apps and definitely low costs, but there were some strange surprises in store for them. There were some issues with licensing, related in particular to the kind of user seats they had and some limitations pertaining to them. This means that one of the seats may only have a number of objects that the user could access, and this might come as a surprising limitation at some of the most critical junctures. Integration of new applications with the existing ones is a critical part of the process of app development, however, in cloud development, the process of integration is laced with a whole lot of challenges. This is because in case of cloud computing, the developers of the companies would not typically have access into the infrastructure of the cloud provider, their applications, and their integration platforms. There have also emerged some performance issues between cloud-based applications and its on-premise system and among multiple applications in the cloud. The real trouble is that if you want to look into the issues and troubleshoot them, you can only go as far as your own infrastructure, and it does limit your ability to solve these issues. As a solution some of the developers have tried sticking to the cloud provider’s APIs as far as possible, which can be accomplished easily because a good number of cloud providers make their APIs available. Cloud development platforms are notorious for the fast pace of evolution they possess. This means that the developers working on cloud need to be on their toes and keep updating their best practices frequently. The platform that you choose to work with, might be frequently releasing updates and enhancing their performance or adding new features all the time, hence it is important for you to keep abreast of all these developments, so that the developers are aware of and prepared for these new developments. However, this is not a possibility for every developer or organization to accomplish, and hence the wildly dynamic nature of cloud computing might pose as a big challenge and the developers may have a tough time playing catch up. Mobile Cloud Computing (MCC) is unique in its construct as it merges the rapidly growing cloud computing applications market with the omnipresent smartphone. The advantages of using mobile cloud computing have been acknowledged and appreciated by the mobile users and cloud-based service providers alike. It is the interface of MCC that has opened up the possibility and scope of incorporating videos, music files, images and a lot more within this little omnipresent device, called the smartphone. Some of the reasons why we claim that Mobile Cloud Computing is all set to become the future of the mobile devices. Since most of the processing is taken care of, by the cloud, the battery usage of the mobile device is automatically brought down. This is the most highlighted USP of the mobile cloud computing – the huge amount of storage ability accessible to the mobile user. This means that the users do not have to worry at all about the kind of storage that is available on their phone or the storage requirement for the app to function. Using Cloud storage, the users have the ability to store & manage all their data, by lightning quick synchronization between the mobile device and the desktop or any other device that the user chooses. This feature eliminates the need to create a backup and maintaining it. In general, it is the processor of the mobile device that determines the speed and its performance. But when it comes to Mobile Cloud Computing, a whole chunk of its processing is carried out at the cloud level. This in turn reduces the load on the device itself, thus improving the overall performance. Not surprisingly, it is the mobile users who benefit the most from the use of Mobile Cloud Computing. The platform has optimized productivity which offers an improved User Experience. Mobile Cloud Computing has an inherent capability to adapt to the dynamic and eternally evolving character of technology. Mobile cloud computing has the capability to perform efficiently with latest upgrades in various methods of cloud computing and tweaks or other changes in the designs and features of latest smartphones. How to go about Cloud Testing? Cloud Testing is an important part of the cloud and to complete your education in the field of cloud testing, it is important that you know how to go about cloud testing. Not only are there more than one types of cloud testing but there is a great range of core tasks in cloud computing, and there are a whole lot of challenges in cloud testing that you need to be prepared for. The realm of cloud testing can be categorized into the following four major types. In this kind of testing the whole cloud is viewed as a whole entity and the testing is carried out on the basis of the kind of features it has. Typically, the Cloud & SaaS vendors are the ones who take interest in carrying out this particular type of testing for the cloud. This is different from the first type as the testing within the cloud is carried out by checking each and every one of its internal features. However, it is only the cloud vendors who can perform this particular type of testing. This is a more intense type of cloud testing where the testing is carried out across a number of different kinds of clouds including private, public, and hybrid clouds as well. This kind of testing includes functional and non-functional testing that is carried out on the basis of the requirements of the application. This is one of the core components that includes testing of functions, end to end business workflows, data security, compatibility with the browser, etc. This component includes testing a variety of network bandwidths, protocols, and successful transfer of data by way of networks. This component covers disaster recovery tests, testing of backups, secure connection, and storage policies. It is imperative that the infrastructure be validated for regulatory compliances. The tasks that are carried out in cloud testing depend on the type of cloud testing that is being carried out at that particular stage. This particular type of testing is typically opted for by cloud or SaaS vendors. In this context, the primary objective is to assure the quality of the service functions that were offered in a cloud or a SaaS program. In this environment, testing is performed for integration, functional, security, unit, system function validation, and Regression Testing as well as performance and scalability evaluation. This testing is carried out by online application vendors that would check the performance and functional testing of the cloud-based services. In situations where applications are connected with legacy systems, it is the quality of the connectivity between the legacy system and the application on the cloud that is under test, that is validated. This type of testing is carried out, in order to check the quality of a cloud-based application across different clouds. It is important that we are aware of the different challenges that might arise in the course of cloud testing. By nature cloud applications are multi-tenant and this can only mean one thing, the risk of data theft is always imminent. It is therefore important that the cloud users are always given a robust assurance about the safety of their data by the suppliers. Hence, the suppliers would always need to play a lot of attention to this aspect more so than in the native or web apps in some cases especially if the app needs to deal with sensitive user data. The nature of the cloud is dynamic, fast paced, and ever-evolving. While that all is good, but this also means that in general the cloud provider would only give a really short notice period of, maybe a week or two to the existing customers about any new upgrades. This can especially turn out to be a problem when one has to manually validate the changes to their SaaS application. Since there are always some changes going on with the cloud and loads of upgrades and tweaks are being implemented by the Cloud service provider all the time, it is only natural that sometimes the external interface also needs to be upgraded. Though this might be a welcome change for many, but most of the existing subscribers might find it challenging as they might be used to the older interface. As a cloud service provider, it is therefore their responsibility to let the subscribers choose the version of interface that they are comfortable working with. It is only natural that at one point or another there would arise the need or a situation that needs migration of data. Migration of data from one Cloud provider to another can prove to be a huge challenge as the two providers might have entirely different database schemas. This means that there would be a need for a lot of effort in order to understand the different data fields, the variety of relationships, and the way they are mapped across the SaaS application. When it comes to Enterprise Application Integration there is a need for data integration validation of both, the inbound and outbound data from client network to SaaS application and the other way around. In such scenarios, data privacy must be afforded quite a bit of focus and must be thoroughly validated so that the SaaS subscribers are assured of security and privacy in context of any of their data. This is the biggest challenge when it comes to cloud testing. It needs to be ensured that when the live upgrades are made, there is no impact on the existing connected SaaS users. To completely understand the cloud testing scenario there is a need to draw comparisons between cloud testing and conventional testing. While doing so there should be a consideration on the following parameters. In conventional testing it is important that you check for interoperability, compatibility, usability. Conventional testing verifies the quality of functioning of the system and the performance of the application based on the provided specification. Cloud testing verifies the quality of performance and functions of SaaS, Clouds and applications by making the best use of a cloud environment. In conventional testing the costs tend to definitely run high. This is because there is a heavy requirement and usage of a huge variety of hardware & software. In cloud testing however, the costs run towards the lower side as you only have to pay for the operational charges which means that you only have to pay for what you use. In conventional testing as well as in the cloud testing, there needs to be a test simulation for online traffic data and for online user access. So, on this parameter both the methods stand ground in pretty much the same manner and measure. In conventional testing the functions (unit & system) as well as the features need to be validated. When it comes to cloud testing end to end application functions need to be tested on SaaS or the cloud. In context of the conventional testing, the test environment is pre-fixed and configured, typically in an equipped test lab. When it comes to cloud testing, you have at your disposal an open public test environment with diverse computing resources. Integration testing in the realm of conventional testing includes component, architecture, and function-based testing. Integration testing on the Cloud is entirely SaaS based. For security testing in the conventional way of doing things, the security features are tested based on process, server, and privacy issues. In context of cloud testing, there need to be a thorough testing of security features based on cloud, SaaS and real time tests in the vendors’ cloud. The performance and scalability testing in conventional testing is performed in a fixed and controlled test environment. The performance and scalability testing in cloud testing is carried out by applying both, real time and virtual online test data. Cloud apps, cloud computing, mobile cloud computing, and mobile cloud apps are all making big waves in the realm of technology. This, however, is more than a series of mere buzzwords, it actually has a whole lot of substance to it, and the trend seems to be here to stay for good. Though the benefits of this technology are many, but there are certain double-edged swords to not just be aware of, but also stay away from. This is still a technology that is in its nascent stage, the scope and potential of it all though seem to be quite promising, the true path that it takes will however, only be a little more clear when more and more companies begin adapting to it and investing in it. Do you think we forgot to add something here about cloud apps or did we miss out on something that could help out our readers? Let us know what else we can speak about and feel free to add your own points here. We would love to know what you think about it!